Slam CAM from Compx - Spokane Hardware Supply, Inc.
CompX has done it again, they introduced the double door cabinet latch last year, filling a need for two cabinet doors that meet in the middle. This year, they've come out with the SlamCAM. It's an additional cam that mounts to the back of any of their National Cabinet Lock cylinders. 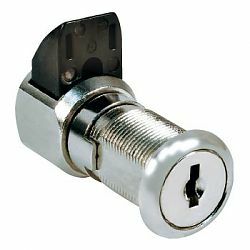 It allows for the door to be closed and automatically lock with a spring loaded latch, eliminating the need to keep the key in the cylinder and re-lock it. Pretty ingenious! For detailed information you can click the link below.